Cholecystokinin is a peptide hormone of the gastrointestinal system responsible for stimulating the digestion of fat and protein. Cholecystokinin, previously called pancreozymin, is synthesized by I-cells in the mucosal epithelium of the small intestine and secreted in the duodenum, the first segment of the small intestine, and causes the release of digestive enzymes and bile from the pancreas and gallbladder, respectively. It also acts as a hunger suppressant. Recent evidence has suggested that it also plays a major role in inducing drug tolerance to opioids like morphine and heroin, and is partly implicated in experiences of pain hypersensitivity during opioid withdrawal. CCK mediates a number of physiological processes, including digestion and satiety. It is released by I cells located in the mucosal epithelium of the small intestine (mostly in the duodenum and jejunum), neurons of the enteric nervous system, and neurons in the brain. Release of CCK is stimulated by monitor peptide released by pancreatic acinar cells as well as CCK-releasing protein, a paracrine factor secreted by enterocytes in the gastrointestinal mucosa. In addition, release of acetylcholine by the parasympathetic nerve fibers of the vagus nerve also stimulates its secretion. The presence of fatty acids and/or certain amino acids in the chyme entering the duodenum is the greatest stimulator of CCK release. CCK mediates digestion in the small intestine by inhibiting gastric emptying and gastric acid secretion. It stimulates the acinar cells of the pancreas to release digestive enzymes and stimulates the secretion of a juice rich in pancreatic digestive enzymes, hence the old name pancreozymin. Together these enzymes catalyze the digestion of fat, protein, and carbohydrates. Thus, as the levels of the substances that stimulated the release of CCK drop, the concentration of the hormone drops as well. The release of CCK is also inhibited by somatostatin and pancreatic peptide. Trypsin, a protease released by pancreatic acinar cells, hydrolyzes CCK-releasing peptide and monitor peptide, in effect turning off the additional signals to secrete CCK. CCK also has stimulatory effects on the vagus nerve, effects that can be inhibited by capsaicin. The stimulatory effects of CCK oppose those of ghrelin, which has been shown to inhibit the vagus nerve. The CCK tetrapeptide fragment CCK-4 (Trp-Met-Asp-Phe-NH2) reliably causes anxiety when administered to humans, and is commonly used in scientific research to induce panic attacks for the purpose of testing new anxiolytic drugs. In recent years, the researchers pay more and more attention to the the relationship between Cholecystokinin and the obesity. For example, Diet-induced obesity accelerates the appearance of CCK-resistance as well as the return of high sensitivity to CCK in further aging, while chronic calorie-restriction prevents the development of resistance, as if the speed of the age-related regulatory changes was altered by the nutritional state. The effects of ICV applied CCK also change with age: the characteristic anorexic and hypermetabolic/hyperthermic effects can be observed in young adult rats, but the effects gradually and monotonically decline with age and disappear by the old age of 24 months. These disparate age-related patterns of CCK efficacy upon peripheral or central administration routes may indicate that although both peripheral and central CCKR-s exert anorexic effects, they may have dissimilar roles in the regulation of overall energy balance. Karebay can synthetic Cholecystokinin with sulfoacid and fluorescent labels, so that scientists can knew more details about its molecular mechanism. Karebay (www.karebaybio.com) has a professional team devoted to biotechnological products and development. We offer high-quality peptide synthesis products for sale around the world, including over 1,000 catalog peptides, and nearly 100 pharmaceutical peptides and cosmetic peptides products. Peptide is a kind of biochemistry material with wide range function and there are many kinds of peptide in drug world. Among these medicinal peptide products, Cyclosporine A becomes a high-profile star because of its unique immune inhibition. Cyclosporine A (often shortened to CsA) is an immunosuppressant drug widely used in organ transplantation to prevent rejection. It reduces the activity of the immune system by interfering with the activity and growth of T cells. It was initially isolated from the fungus Tolypocladium inflatum (Beauveria nivea), found in a soil sample obtained in 1969 from Hardangervidda, Norway, by Hans Peter Frey, a Sandoz biologist. Most peptides are synthesized by ribosomes, but ciclosporin is a cyclic nonribosomal peptide of 11 amino acids and contains a single D-amino acid, which are rarely encountered in nature . The immunosuppressive effect of ciclosporin was discovered on 31 January 1972 by employees of Sandoz (now Novartis) in Basel, Switzerland, in a screening test on immune suppression designed and implemented by Hartmann F. Stähelin. The success of ciclosporin in preventing organ rejection was shown in kidney transplants by R.Y. Calne and colleagues at the University of Cambridge, and in liver transplants performed by Thomas Starzl at the University of Pittsburgh Hospital. The first patient, on 9 March 1980, was a 28-year-old woman. Ciclosporin was subsequently approved for use in 1983. Ciclosporin is approved by the FDA to prevent and treat graft-versus-host disease in bone-marrow transplantation and to prevent rejection of kidney, heart, and liver transplants. It is also approved in the US for the treatment of rheumatoid arthritis and psoriasis and as an ophthalmic emulsion for the treatment of dry eyes. In addition to these indications, ciclosporin is also used in severe atopic dermatitis, Kimura’s disease, pyoderma gangrenosum, chronic autoimmune urticaria, and, infrequently, in rheumatoid arthritis and related diseases, although it is only used in severe cases. Ciclosporin has also been used to help treat patients with acute severe ulcerative colitis that do not respond to treatment with steroids. This drug is also used as a treatment of posterior or intermediate uveitis with noninfective etiology. Today, Cyclosporine has been used in clinic for a long time, and the research on its molecular mechanism is more and more hot. Karebay can synthetic Cyclosporine with biotin and fluorescent labels, so that scientists can knew more details about its molecular mechanism. karebay (www.karebaybio.com) has a professional team devoted to peptide products synthesis and development. We offer high-quality peptide synthesis products for sale around the world, including over 1,000 catalog peptides, and nearly 100 pharmaceutical peptides and cosmetic peptides products. References  Cantrell DA, Smith KA (1984). “The interleukin-2 T-cell system: a new cell growth model”. Science. 224 (4655): 1312–1316. Mott JL, et al. (July 2004). “Cardiac disease due to random mitochondrial DNA mutations is prevented by cyclosporin A”. Biochem. Biophys. Res. Commun. 319 (4): 1210–5. Xiao Z,et al. Mechanisms of cyclosporine-induced renal cell apoptosis: a systematic review. Am J Nephrol. 2013;37(1):30-40. Alkaloid peptides are a group of naturally occurring chemical compounds containing mostly basic nitrogen atoms. Alkaloids peptides are generated by organisms such as bacteria, fungi, plants and animals as well. Most alkaloids can be extracted and purified by acid-base extraction. And many alkaloids peptides are toxic to other organisms. Alkaloids peptides often have pharmacological effects and can be used as medications and recreational drug or in entheogenic rituals. Typical examples of peptide alkaloid are: ergotamine, pandamine, dynorphin A-(1-8)-octapeptide, N beta-(D-Leu-D-Arg-D-Arg-D-Leu-D-Phe)-naltrexamine, etc. The applications of alkaloids peptides have covered the medical and agricultural fields. Alkaloids peptides play roles in a diversity of metabolic systems in humans and other animals . Ergotamine is an ergopeptine and part of the ergot family of alkaloids; it is structurally and biochemically closely related to ergoline. It possesses structural similarity to several neurotransmitters, and has biological activity as a vasoconstrictor. It is used medicinally for treatment of acute migraine attacks (sometimes in combination with caffeine). Medicinal usage of ergot fungus began in the 16th century to induce childbirth, yet dosage uncertainties discouraged the use. It has been used to prevent post-partum haemorrhage (bleeding after childbirth). It was first isolated from the ergot fungus by Arthur Stoll at Sandoz in 1918 and marketed as Gynergen in 1921. The mechanism of action of ergotamine is complex. The molecule shares structural similarity with neurotransmitters such as serotonin, dopamine, and epinephrine and can thus bind to several receptors acting as an agonist. The anti-migraine effect is due to constriction of the intracranial extracerebral blood vessels through the 5-HT1B receptor, and by inhibiting trigeminal neurotransmission by 5-HT1D receptors. Ergotamine also has effects on the dopamine and norepinephrine receptors. Its side effects are due mainly to its action at the D2 dopamine and 5-HT1A receptors . Ergotamine produces vasoconstriction peripherally as well as damages the peripheral epithelium. In high doses ergotamine is conducive to vascular stasis, thrombosis and gangrene. It can increase uterine contractivity and occasionally is used therapeutically immediately post-partum to decrease uterine bleeding. See also ergometrine. Ergotamine continues to be prescribed for migraines. In recent years, the researchers pay more and more attention to the side effect of ergotamine. For example, Takotsubo cardiomyopathy (TC) is a recently increasing diagnosed disease showed by transient apical or mid-apical left ventricular dysfunction. It is known as a disease of postmenopausal women, which is usually triggered by emotional or physical stress. Although the trigger is mostly endogenous, some drugs have also been reported as the cause. Published case reports of TC associated with drug usage consist of sympathomimetic drugs, inotropic agents, thyroid hormone, cocaine, and 5-fluorouracil. Some researchers present an unusual case of TC in which the possible trigger is ergotamine toxicity . Today, ergotamine has been used in clinic for a long time, even the treatment of AIDS, but the research on its side effects are more and more hot, a lot of the laboratory are studying its molecular mechanism, and Karebay can synthetic ergotamine with High purity. Karebay (www.karebaybio.com) has a professional team devoted to peptide synthesis and development. We offer high-quality peptide synthesis products for sale around the world, including over 1,000 catalog peptides, and nearly 100 pharmaceutical peptides and cosmetic peptides products. References:  Walkembach J, et al. (October 2005). “Interactions of metoclopramide and ergotamine with human 5-HT3A receptors and human 5-HT reuptake carriers”. Br. J. Pharmacol. 146 (4): 543–52. Schardl CL, et al. (2006). “Ergot alkaloids–biology and molecular biology”. Alkaloids Chem. Biol. The Alkaloids: Chemistry and Biology 63: 45–86. Ozpelit E, et al. Ergotamine-Induced Takotsubo Cardiomyopathy. Am J Ther. 2014 Aug 5. Corona viruses have traditionally been associated with mild upper respiratory tract infections throughout the world. In the fall of 2002, a new corona virus emerged in Asia causing severe viral pneumonia, i.e., severe acute respiratory syndrome (SARS). Nearly a decade following the SARS epidemic, a new corona virus causing severe viral pneumonia has emerged, i.e., middle east respiratory syndrome (MERS). Since the initial case of MERS-CoV occurred in June of 2012 in Saudi Arabia there have been 688 confirmed cases and 282 deaths in 20 countries. Although both SARS and MERS are caused by corona viruses, SARS was characterized by efficient human transmission and relatively low mortality rate. In contrast, MERS is relatively inefficiently transmitted to humans but has a high mortality rate. Given the potential overlap in presentation and manifestation, it is important to understand the clinical and epidemiologic differences between MERS, SARS and influenza. MERS-CoV has caused outbreaks of a SARS-like illness with high case fatality rate. The reports of its person-to-person transmission through close contacts have raised a global concern about its pandemic potential. Here we characterize the six-helix bundle fusion core structure of MERS-CoV spike protein S2 subunit by X-ray crystallography and biophysical analysis. We find that two peptides， HR1P and HR2P， spanning residues 998–1039 in HR1 and 1251–1286 in HR2 domains， respectively, can form a stable six-helix bundle fusion core structure， suggesting that MERS-CoV enters into the host cell mainly through membrane fusion mechanism. HR2P can effectively inhibit MERS-CoV replication and its spike protein-mediated cell–cell fusion. Introduction of hydrophilic residues into HR2P results in significant improvement of its stability， solubility and antiviral activity. Therefore, the HR2P analogues have good potential to be further developed into effective viral fusion inhibitors for treating MERS-CoV infection . Recently, the Ebola virus in Africa has caused serious consequences. Antiviral drugs research and development is more and more important, polypeptide of antiviral drugs is also a kind of promising products. For example, Cationic antimicrobial peptides (AMPs) and host defense peptides (HDPs) show vast potential as peptide-based drugs. Great effort has been made in order to exploit their mechanisms of action, aiming to identify their targets as well as to enhance their activity and bioavailability. Emphasis will be given to their biochemical features, selectivity against extra targets, and molecular mechanisms. Peptides which possess antitumor activity against different cancer cell lines will be discussed, as well as peptides which inhibit virus replication, focusing on their applications for human health, animal health and agriculture, and their potential as new therapeutic drugs . Karebay Biochem (www.karebaybio.com) has a professional team devoted to peptide products synthesis and development. We offer high-quality peptide synthesis products for sale around the world, including over 1,000 catalog peptides, and nearly 100 pharmaceutical peptides and cosmetic peptides products. Cunha CB, Middle East respiratory syndrome (MERS): A new zoonotic viral pneumonia. Virulence. 2014 Aug 15;5(6):650-654. Lu L, et al. Structure-based discovery of Middle East respiratory syndrome coronavirus fusion inhibitor. Nat Commun. 2014;5:3067. Kelly C. L. Mulder, et al. Current scenario of peptide-based drugs: the key roles of cationic antitumor and antiviral peptides. Front. Microbiol., 31 October 2013. Some study demonstrates that lipoxin affects both secretion and absorption in airway epithelium. In non‐CF bronchial epithelium, lipoxin increases ASL height by inhibiting ENaC to decrease Na+ absorption and by activating CFTR to enhance Cl‐secretion. In CF bronchial epithelium, lipoxin restores ASL height mainly by inhibiting ENaC in the absence of CFTR activity. Inflammatory response has been a hot issue of biological research. There are IL-1, IL-2 and IL-17 signaling pathway in the inflammatory response, and among them, IL – 1 signaling pathway is particularly important. Interleukin-1 (IL-1) is a pro-inflammatory cytokine that signals primarily through the type 1 IL-1 receptor (IL-1R1). The activities of IL-1 include induction of fever, expression of vascular adhesion molecules, and roles in arthritis and septic shock. The inflammatory activities of IL-1 are partially derived by transcriptionally inducing expression of cytokines such as TNF-alpha and interferons, as well as inducing the expression of other inflammation-related genes. There are two forms of IL-1 encoded by distinct genes, IL-1 alpha and IL-1 beta. IL-1 beta is produced as a 269 amino acid precursor that is cleaved by IL-1beta converting enzyme (ICE) to the active IL-1 beta form that is secreted. IL-1 signaling is opposed by the naturally occurring peptide IL-1 receptor antagonist which is a therapeutic agent for the treatment of arthritis.The type 1 IL-1 receptor protein binds IL-1 beta but requires the IL-1 receptor accessory protein (IL-1RAcP) to transduce a signal. IL-1 binding cause’s activation of two kinases, IRAK-1 and IRAK-2, associated with the IL-1 receptor complex. IRAK-1 (IL-1 Receptor Associated Kinase) activates and recruits TRAF6 to the IL-1 receptor complex. TRAF6 activates two pathways, one leading to NF-kB activation and another leading to c-jun activation. The TRAF associated protein ECSIT leads to c-Jun activation through the Map kinase/JNK signaling system. TRAF6 also signals through the TAB1/TAK1 kinases to trigger the degradation of I-kB, and activation of NF-kB. The IL-1 signaling cascade represents a highly conserved response to pathogens through evolution, with homologs in insects and even in plants. The signal transduction cascade utilized by IL-1 receptor is similar to that of TNF, resulting in NF-kB activation, and is most similar to that of the Toll-like receptors that also participate in inflammatory signaling responses to pathogen components like endotoxin (see Toll-like receptor pathway). KareBay™ Biochem has developed and continuously expands upon a comprehensive list of small molecule inhibitors, relevant to multiple channels and active sites critical to biological processes. KareBay Biochem has many IL-1 signaling pathway inhibitors; if you want to research inflammatory response, KareBay Biochem can help you. Norris PC, Gosselin D, Reichart D, Glass CK, Dennis EA. Proc Natl Acad Sci U S A. 2014 Aug 19. pii: 201404372. Al-Alawi M, Buchanan P, Verriere V, Higgins G, McCabe O, Costello RW, McNally P, Urbach V, Harvey BJ.Physiol Rep. 2014 Aug 7;2(8). pii: e12093. doi:10.14814/phy2.12093. Print 2014 Aug 1. The researcheres from the Biozentrum of the University of Basel find that aberrant mTOR signaling in the liver not only affects hepatic metabolism but also whole body physiology. The result was published in Proceedings of the National Academy of Sciences. The protein mTOR is a central controller of growth and metabolism. Deregulation of mtor inhibitors signaling increases the risk of developing metabolic diseases. In the cell, this regulatory protein is found in two structurally and functionally distinct protein complexes called mTORC1 and mTORC2. mTORC1 hyperactivation enhances the level of the stress hormone FGF21 by depletion of the amino acid glutamine. Treatment of animals with glutamine reduced the level of FGF21 and thus prevented the physiological impairments. So the activation of mTORC1 in the liver of mice reduces not only hepatic lipid metabolism but also locomotor activity and body temperature. mTORC1 inhibitors such as rapamycin are currently used as immunosuppressive agents and anti-cancer drugs. Thus, the novel findings provide evidence that treatment of glutamine addicted human cancers with rapamycin might have beneficial effects by blocking tumor growth and by preventing deregulation of whole body physiology. I have read an article about peptide product. Peptides are important for biochemical processes and physiological functions. So research in peptide synthesis or mechanism of action are of great interest. The article had described the status of peptide treatment, Now. Share the information with you. “Within the last years, the global market for peptide therapeutics expanded nearly twice as fast as overall drugs. Up to now, nearly 70 peptide drugs were approved by the US Food and Drug Administration (FDA) and reached the medicinal market. In addition, many peptides are currently in clinical (>150) and advanced preclinical (>400) phases, exemplifying the urgent demand of peptides for various indications. In 2005, the market for peptide drugs covered 8 billion EUR and was estimated to reach 11.5 billion EUR in 2013. The market growth rate has been projected to be over 10% per year. To date, 4% of overall approved pharmaceuticals are peptide hormones or derivatives. Besides this success story, there are limitations restricting the use of peptides as drugs. Notably, their low bioavailability owing to proteolytic degradation by enzymes of the intestine, blood and cell plasma leads to short circulating half-lives. Depending on their size, peptides are excreted by kidneys (renal clearance) or liver (hepatic clearance) within minutes. Nevertheless, their ability to pass through membranes and the urgent need of alternative, more comfortable administration routes as the commonly used parenteral (subcutaneous, intramuscular and intravenous) application, have prompted further research in this field’’. Automated solid-phase peptide synthesis to obtain therapeutic peptides, Veronika Mäde, Sylvia Els-Heindl, Annette G Beck-Sickinger ,Beilstein J Org Chem. 2014; 10: 1197–1212. A team of researcher from Manchester University reveals that a new drug could prove useful in treating small cell lung cancer — the most aggressive form of lung cancer. The article was published in Clinical Cancer Research. In the study, researchers tested AZD3965 that targets one of these molecules, MCT1, in lung cancer cells and in mouse models. In cancer cells there is a switch to using glycolysis, a process that requires less oxygen and produces lactate as a by-product. Certain molecules — monocarboxylate transporters (MCTs) — are involved in the movement of lactate out of cells and drugs that target MCTs have been shown to stop tumour growth. The study showed that in those cells lacking an alternate lactate transporter, MCT4, the drug had an effect. They found that AZD3965 increased the level of lactate in cells and, more importantly, reduced tumour growth. Through tumour samples taken from lung cancer patients, found that high levels of MCT1 were linked to worse patient prognosis. At present, Novartis currently has two drug candidates in development. Both KAE609 and KAF156 are new classes of anti-malarial compounds that treat malaria in different ways from current therapies, important to combat emerging drug resistance. Novartis has also identified PI4K as a new drug target with potential to prevent, block and treat malaria. The Ras family of proteins is one of the most important components of cellular signaling networks in biology and major drivers of cancers. 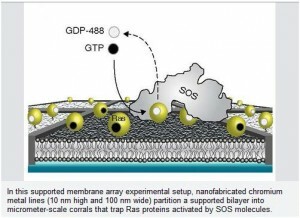 Recently, scientists with the U.S. Department of Energy (DOE)’s Lawrence Berkeley National Laboratory (Berkeley Lab) and the University of California (UC) Berkeley, have unlocked the secret behind the activation of the Ras family. The cellular signaling networks of living cells start with receptor proteins residing on a cell’s surface that detect and interact with the environment. Signals from these receptors are transmitted to chemical networks within the cell that process the incoming information, make decisions, and direct subsequent cellular activities. Ras proteins are essential components of signaling networks that control cellular proliferation, differentiation and survival. Mutations in Ras genes were the first specific genetic alterations linked to human cancers and it is now estimated that nearly a third of all human cancers can be traced to something going wrong with Ras activation. Defective Ras signaling has also been cited as a contributing factor to other diseases, including diabetes and immunological and inflammatory disorders. Despite this long history of recognized association with cancers and other diseases, Ras proteins have been dubbed “un-druggable,” largely because their activation mechanism has been poorly understood. Overcame the challenge in the experiment. They know the activation mechanism of Ras family. The outcome can be directly determined by the process of averaging. Even though the behavior of an individual protein is intrinsically variable, the average behavior from a large group of identical proteins is precisely determined by molecular level probabilities. 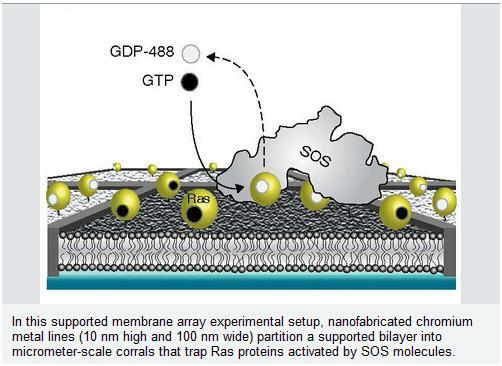 Ras activation in a living cell, however, involves a relatively small number of SOS molecules, making it impossible to average the variable behavior of the individual molecules. This variation is referred to as stochastic “noise” and has been widely viewed by scientists as an error a cell must overcome.